If your site uses secured services, see Types of Security Supported in Android. To allow end users to download the installation package from a web server, you can use any web server capable of serving .apk, .tpk, and .json files. 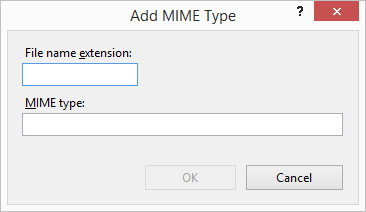 If you use Internet Information Services (IIS), you will need to add MIME types for each of these file extensions. Follow the instructions below. * The Geocortex Mobile App Framework for Android supports both TLS 1.2 and Windows Authentication separately, but not in conjunction.